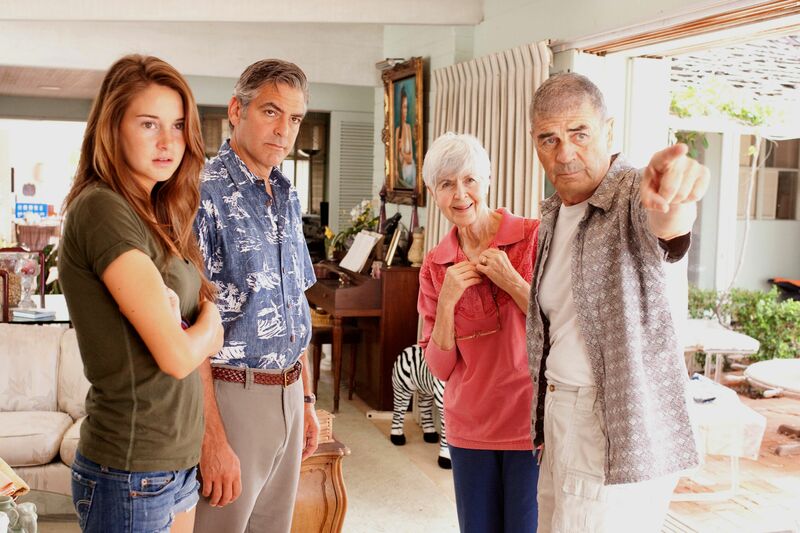 In The Descendants, director Alexander Payne (creator of the Oscar-winning Sideways) follows the unpredictable journey of an American family at a crossroads. 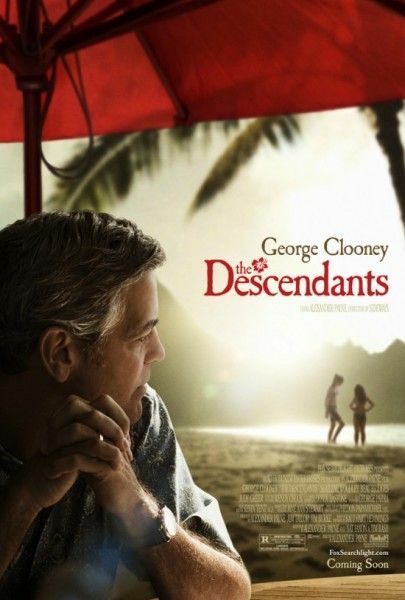 Set in picturesque Hawaii, Matt King (George Clooney), husband and father of two girls, is forced to re-examine his life when his wife is incapacitated in a boating accident. While attempting to repair his relationship with his 17-year old daughter Alexandra (Shailene Woodley) and 10-year-old Scottie (Amara Miller), he learns things about his wife and his family that he was never even aware of, but that send him down the path toward rebuilding his life. Question: How did you find this book? Were you looking for a project to do and someone recommended it, or did you come across it yourself? 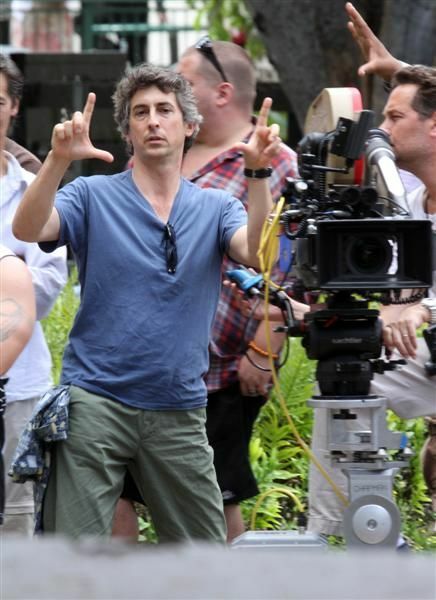 ALEXANDER PAYNE: My flag is always flying. My shingle is always out. I’m always looking for movie ideas. The hardest part of this whole movie-making endeavor is finding ideas. That’s the real goal. We – and by “we,” I mean my producing partners and I – optioned this book in 2007. You probably read hundreds of books. What was it about this book that made you think, “I could do a great adaptation. This would be a great movie.”? PAYNE: It was just a nice, human story in an exotic locale. Did you just really want to go to Hawaii? PAYNE: Well, that was a bonus, and not just for the obvious. I thought, “I’ve never really seen Hawaii, or specifically Honolulu, portrayed in a film before,” and I like Hawaii a lot. I just thought it would be fun and interesting. It’s really weird out there, and it’s interesting. I lament that, in big cities, we don’t have what we have in small cities, which is just spontaneously going to someone’s house and sitting down and talking, for a long time. It’s really tough in this city, as you know. This film has an incredible balance between the visual and the story. You’re in this beautiful location, and yet you’re so absorbed by the characters and story that you almost become oblivious to the beauty of Hawaii itself. How did you achieve that? PAYNE: I think a lot about how to make movies, where you have a keen eye on the characters in the foreground, but always, in the background, something is happening. You may note that I don’t use long lenses very much. I tend to veer more toward wide lenses, where you see the characters in the foreground, but there’s always something happening in the background. Among directors whom I admire, who do the same thing, I would cite Anthony Mann, who made a lot of Westerns in the ‘50s with James Stewart. In my mind, he was a great master at keeping the foreground story, but always having the shifting landscape in the background, which is somehow commenting subliminally on the story. Your films tend to have middle-aged men in crisis. Why are you interested in those types of stories? George Clooney seems to joke a lot about how he wanted to be in Sideways, but you didn’t cast him in that film. PAYNE: Yeah, I never bring that up myself. Why did you think he was right for this film? PAYNE: Because he’s perfect. First of all, even before I had met him for Sideways, I thought that he and I would work well together. I was sad that I didn’t think he was right for Sideways, and that I’d missed that opportunity to work with him. But, when I began work on this film, he was my first and only choice. He’s the right age and he’s the right look. In as much as sometimes, in his films, we audience members feel that he’s maybe a little emotionally detached, I thought that would work well for this character, who has this emotional awakening from someone who’s been asleep or unaware or detached, or whatever word you’d like to use. 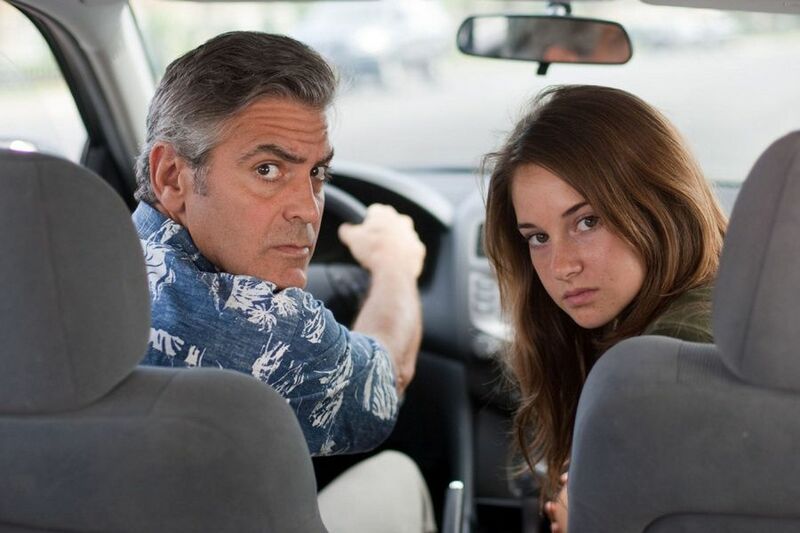 What did Shailene Woodley bring to this role, and why did you decide to cast her? PAYNE: Boy, she’s the cat’s pajamas. She has this seemingly fake enthusiasm and positiveness, but it’s for real, and it’s creepy. No. She’s a positive human, and boy, what a good actress. Between my casting director and I, we probably looked at well over a couple hundred gals for that part. I wanted someone who had equal parts fire and vulnerability. My mental model had been a 17-year-old Debra Winger. That’s whom I would have cast, in that part. Did she have to do a test screening with George Clooney? PAYNE: No, I’ve never done that, in my life. I’ve just had good luck. Those two guys in Sideways – [Thomas Haden] Church and [Paul] Giamatti – had never met until about two weeks before we started shooting. I figure, as long as I’m picking them all, it’s going through a certain sifter and it will be okay. Thank Christ, I haven’t been wrong yet. Also, consider that the cinema has a remarkable capacity to lie. You say, “Here’s a father and daughter,” and audiences say, “Oh, okay,” even if they don’t have all the chemistry. But, you certainly can tell in movies where there’s no chemistry between the actors. This is a bit of an arcane example, but I never believed the chemistry between Maximillian Schell and Melina Mercouri in Topkapi. I loved the film. It’s a super-fun film. But, they’re supposed to be lovers, and there’s zero chemistry between them. Maybe because her husband (Jules Dassin) was directing it. Had you seen Shailene Woodley in her TV show, The Secret Life of the American Teenager? PAYNE: I’d never seen her in anything. I just saw her in her audition. I cast off of auditions. I always do. Which scene did she audition with? PAYNE: I make actors jump in head first, so it was the, “Mom was cheating on you,” scene. And then, she was so good in the audition that I said, “Just to confirm, do you mind reading another scene cold?” I forget what that one was. What brings you to these unusual love stories? PAYNE: I don’t know. We have plenty of those other kinds of stories, and I do like strange love stories. Midnight Cowboy is such a beautiful love story. The Last Detail is a beautiful three-way love story. Driving Miss Daisy is a very beautiful love story. When love crosses gender, age, class, and social conventions, it’s very beautiful. The Last Detail is a love story between two prison keepers, and their prisoner. None of them want to be there, and they find a way to love through that. It’s nice. But, rarely do you see a love story between a man and a comatose woman. PAYNE: Yeah. A buddy of mine from film school, who watched an early cut, remarked that he had a shifting relationship with the comatose wife, during the whole film. He said, “At the beginning, I had one feeling. In the middle, I hated her. And then, by the end, I just found that I suddenly loved her.” That had never struck me before. In a way, she’s the one writing the script of the whole film, that the rest of them are just acting out. Although silent, she speaks. How close did you work with the author on this? PAYNE: I did my own adaptation, but I would say that it’s by far the most faithful adaptation I’ve ever done. I relied upon her advice, to make sure I was getting the twists and turns of phrase in the script right, and then I also relied upon her a lot to open some doors for me, in that upper-class world in Honolulu. That’s not my world. Always, when you make a film in a sub-culture, like with the Armenians in Sideways, you need a guide. PAYNE: I have the next two films lined up, and I can’t wait to start shooting, actually. The next one is tentatively called Nebraska, and it’s a father-son road trip, from Montana to Nebraska. After that is the adaptation of a Daniel Clowes graphic novel, called Wilson. With any measure of good luck, I’ll start shooting Nebraska in May. And then, I’d like to start shooting Wilson, possibly as early as November, but I bet in January of 2013. I want to start moving quickly. Is Nebraska an original script? PAYNE: Nebraska is an original, by some guy out of Snohomish, Washington. What do you enjoy about taking existing work and making it into a film? PAYNE: A book suggests a whole world and story that I could have never thought of, in a million years. I could have never thought of Sideways. I could have never thought of this guy whose wife has been stepping out on him, and the aristocracy of Honolulu. Who the hell would ever think of that? Rex Pickett with Sideways, and Kaui Hemmings with this one, wrote autobiographically, or at least about a world that they know. I’m then able to get something really specific, and hopefully make it into something universal. It allows me to then travel to a place that I never could have thought of, but still be able to put my personal stamp on it. Of course, it’s a highfalutin example, but 11 of Kubrick’s 13 films were adaptations, and yet they’re all Kubrick films, from Barry Lyndon to 2001 to A Clockwork Orange. They are widely disparate films, but with such a strong through-line.